Pyrolobus fumarii Blöchl et al. 1997 is the type species of the genus Pyrolobus, which belongs to the crenarchaeal family Pyrodictiaceae. The species is a facultatively microaerophilic non-motile crenarchaeon. 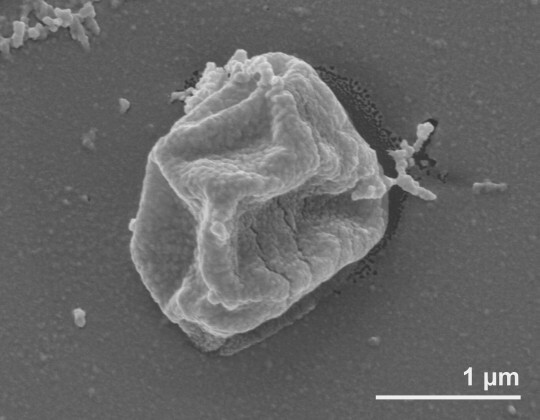 It is of interest because of its isolated phylogenetic location in the tree of life and because it is a hyperthermophilic chemolithoautotroph known as the primary producer of organic matter at deep-sea hydrothermal vents. P. fumarii exhibits currently the highest optimal growth temperature of all life forms on earth (106°C). This is the first completed genome sequence of a member of the genus Pyrolobus to be published and only the second genome sequence from a member of the family Pyrodictiaceae. Although Diversa Corporation announced the completion of sequencing of the P. fumarii genome on September 25, 2001, this sequence was never released to the public. 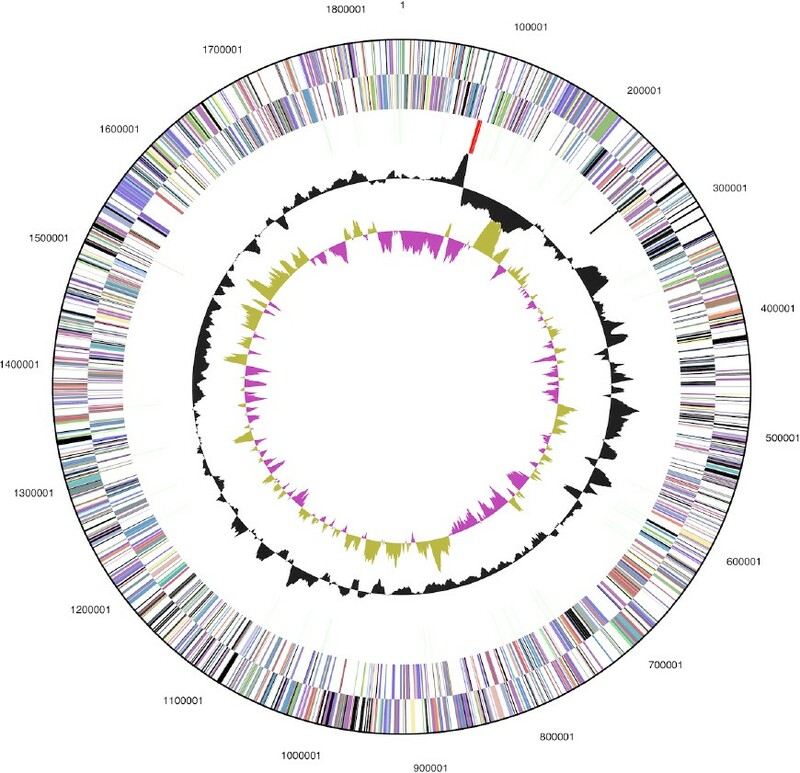 The 1,843,267 bp long genome with its 1,986 protein-coding and 52 RNA genes is a part of the Genomic Encyclopedia of Bacteria and Archaea project. Strain 1AT (= DSM 11204) is the type strain of the species Pyrolobus fumarii, which is the type and only species of its genus Pyrolobus . The generic name derives from the Greek word pyr meaning fire and the Greek word lobos meaning lobe, referring to fire lobe. The species epithet is derived from the Latin word fumarii meaning of the chimney, referring to its black smoker biotope . Strain 1AT was isolated from a black smoker wall, TAG site, Mid Atlantic Ridge , effectively published in 1997  and validly published in 1999 . It is thus far the most heat-tolerant, and also most heat-requiring of all validly named prokaryotic species. P. fumarii appears to be the primary producer of organic material in such deep-sea hydrothermal vent habitats . At the time of its discovery, P. fumarii extended the upper temperature limit for life to 113°C . A more recent report on a not yet validly named and incompletely characterized iron-reducing archaeon, known only as ‘Strain 121’ appears to extend the upper growth temperature to 121°C, which is well within standard autoclaving temperatures . Here we present a summary classification and a set of features for P. fumarii strain 1AT, together with the description of the complete genomic sequencing and annotation. The single genomic 16S rRNA sequence of strain 1AT was compared using NCBI BLAST  under default settings (e.g., considering only the high-scoring segment pairs (HSPs) from the best 250 hits) with the most recent release of the Greengenes database  and the relative frequencies of taxa and keywords (reduced to their stem ) were determined, weighted by BLAST scores. The most frequently occurring genera were Aeropyrum (18.1%), Desulfurococcus (11.1%), Ignicoccus (9.8%), Vulcanisaeta (7.8%) and Staphylothermus (7.0%) (68 hits in total). Regarding the single hit to sequences from members of the species, the average identity within HSPs was 99.0%, whereas the average coverage by HSPs was 46.1%. Among all other species, the one yielding the highest score was Hyperthermus butylicus (NC_008818), which corresponded to an identity of 99.2% and an HSP coverage of 46.1%. (Note that the Greengenes database uses the INSDC (= EMBL/NCBI/DDBJ) annotation, which is not an authoritative source for nomenclature or classification.) The highest-scoring environmental sequence was AB293243 (‘Microbial structures around area Southern Mariana Trough hydrothermal sulfide structure clone Pcsc3A31’), which showed an identity of 96.9% and an HSP coverage of 44.7%. The most frequently occurring keywords within the labels of environmental samples which yielded hits were ‘spring’ (12.0%), ‘hot’ (7.5%), ‘microbi’ (7.0%), ‘nation, park, yellowston’ (6.2%) and ‘geochem’ (3.7%) (181 hits in total). Environmental samples which yielded hits of a higher score than the highest scoring species were not found. These keywords reflect some of the ecological features and properties reported for strain 1AT in the original description . Figure 1 shows the phylogenetic neighborhood of P. fumarii in a 16S rRNA based tree. The sequence of the single 16S rRNA gene copy in the genome does not differ from the previously published 16S rRNA sequence (X99555), which contains eleven ambiguous base calls. Phylogenetic tree highlighting the position of P. fumarii relative to the type strains of the other species within the order Desulfurococcales. The tree was inferred from 1,333 aligned characters [8,9] of the 16S rRNA gene sequence under the maximum likelihood (ML) criterion . Rooting was done initially using the midpoint method  and then checked for its agreement with the current classification (Table 1). The branches are scaled in terms of the expected number of substitutions per site. Numbers adjacent to the branches are support values from 1,000 ML bootstrap replicates  (left) and from 1,000 maximum parsimony bootstrap replicates  (right) if larger than 60%. Lineages with type strain genome sequencing projects registered in GOLD  are labeled with one asterisk, those also listed as ‘Complete and Published’ with two asterisks (see [15–21], and CP002051 for Staphylothermus hellenicus). Cells of strain 1AT are regularly to irregularly lobed cocci with a diameter of approximately 0.7–2.5 µm (Figure 2) . The strain is non-motile, non-spore-forming and facultatively microaerophilic (Table 1). Strain 1AT has a temperature range for growth between 90°C and 113°C (optimum 106°C) and is unable to propagate at a temperature of 90°C or below [1,32]. Exponentially growing cultures of P. fumarii survive even autoclaving at 121°C for one hour . At the optimum growth temperature, doubling time of P. fumarii is 60 minutes . The pH range for growth is 4.0–6.5, with an optimum pH of 5.5 . The strain forms white colonies (1 mm in diameter) on Gelrite-containing media . Like in Hyperthermus, no cell-to-cell network is formed and the S-layer exhibits a central depression, most likely a pore [1,32]. Such networks of extracellular tubules appear to be characteristic for members of the genus Pyrodictium. P. fumarii strain 1AT is able to grow on medium that contains 1%-4% NaCl, with an optimum salinity at 1.7% . The organism uses CO2 as the single carbon source and H2 as the obligate electron donor . The organism is tolerant to high pressure condition (25,000 kPa) . Under anaerobic and microaerophilic conditions, P. fumarii is obligately chemolithoautotroph and is able to oxidize H2 coupled with NO3-, S2O32- and O2 as electron acceptors . Nitrate is reduced to ammonia . Organic compounds do not stimulate the growth of P. fumarii . P. fumarii does not grow in media containing acetate, pyruvate, glucose, starch and elementary sulfur . A highly selective enrichment method for P. fumarii in comparison to other members of the family Pyrodictiaceae is based on the use of nitrate as the sole electron acceptor . Crude extracts of P. fumarii strain 1AT cells show a strong cross-reaction with antibodies prepared against the thermosome of Pyrodictium occultum , which could suggest highly similar chaperonin protein complexes. Furthermore, a membrane-associated hydrogenase with an optimum reaction temperature of 119°C is found in cells grown on molecular hydrogen and nitrate . Interestingly, succinyl-CoA reduction in P. fumarii is not NAD(P)H-dependent, but requires reduced methyl viologen as in Ignicoccus hospitalis [33,34]. In the RNA of hyperthermophiles, posttranscriptional modification has been identified as a leading mechanism of structure stabilization [35–39]. Twenty-six modified nucleosides of P. fumarii are detected, 11 of which are methylated in ribose . P. fumarii exhibits a novel RNA nucleosides characterized as 1,2′-O-dimethylguanosine (m1Gm) . 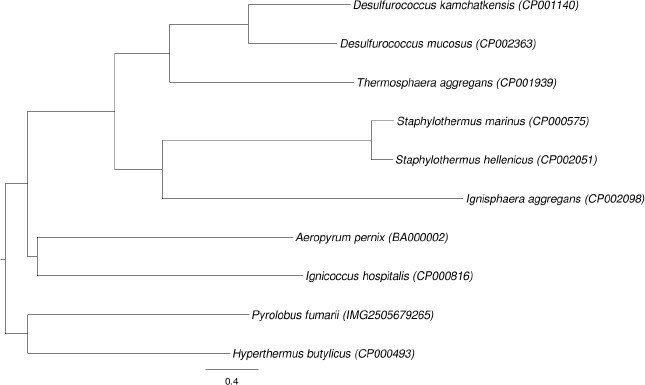 Classification and general features of P. fumarii 1AT according to the MIGS recommendations  and the NamesforLife database . The S-layer of strain 1AT exhibits p4 symmetry with a lattice of 18.5 nm that encloses a 40-nm-wide ‘quasi-periplasmic space’ . The major core lipids of strain 1AT are uncyclized glycerol-dialkyl-glycerol-tetraether (GDGT) and traces of 2,3-di-O-phytanyl-sn-glycerol (diether) . Cells of strain 1AT do not contain C20 C25 diethers and cyclized GDGT . Non-hydrolyzed lipids contain a main spot on TLC staining blue (instead of violet) by anisaldehyde . The major organic solute of strain 1AT is di-myo-inositol phosphate (DIP) . DIP and its derivatives are consistently associated with the heat stress response and therefore, are probably involved in the thermoprotection . UDP-sugars are present in cells of strain 1AT . The structures of the two major UDP-sugars are identified as UDP-α-GlcNAc3NAc and UDP-α-GlcNAc3NAc-(4←1)-β-GlcpNAc3NAc . UDP-sugars are intermediates of an N-linked glycosylation pathway of strain 1AT . Strain 1AT performs a posttranscriptional modification of transfer RNA . P. fumarii 1AT, DSM 11204, was grown anaerobically in DSMZ medium 792 (Pyrolobus fumarii medium)  at 103°C. DNA was isolated from 0.5–1 g of cell paste using Qiagen Genomic 500 DNA Kit (Qiagen, Hilden, Germany) following the standard protocol as recommended by the manufacturer. The genome was sequenced using a combination of Illumina and 454 sequencing platforms. All general aspects of library construction and sequencing can be found at the JGI website . Pyrosequencing reads were assembled using the Newbler assembler (Roche). The initial Newbler assembly consisting of ten contigs in one scaffold was converted into a phrap  assembly by making fake reads from the consensus, to collect the read pairs in the 454 paired end library. Illumina sequencing data (3,232.0 Mb) was assembled with Velvet  and the consensus sequences were shredded into 1.5 kb overlapped fake reads and assembled together with the 454 data. The 454 draft assembly was based on 79.2 Mb 454 draft data and all of the 454 paired end data. Newbler parameters are -consed -a 50 -l 350 -g -m -ml 20. The Phred/Phrap/Consed software package  was used for sequence assembly and quality assessment in the subsequent finishing process. After the shotgun stage, reads were assembled with parallel phrap (High Performance Software, LLC). Possible mis-assemblies were corrected with gapResolution , Dupfinisher, or sequencing cloned bridging PCR fragments with subcloning or transposon bombing (Epicentre Biotechnologies, Madison, WI) . Gaps between contigs were closed by editing in Consed, by PCR and by Bubble PCR primer walks (J.-F. Chang, unpublished). A total of 12 additional reactions were necessary to close gaps and to raise the quality of the finished sequence. Illumina reads were also used to correct potential base errors and increase consensus quality using a software Polisher developed at JGI . The error rate of the completed genome sequence is less than 1 in 100,000. Together, the combination of the Illumina and 454 sequencing platforms provided 1,813.8 × coverage of the genome. The final assembly contained 431,902 pyrosequence and 44,889,308 Illumina reads. Genes were identified using Prodigal  as part of the Oak Ridge National Laboratory genome annotation pipeline, followed by a round of manual curation using the JGI GenePRIMP pipeline . The predicted CDSs were translated and used to search the National Center for Biotechnology Information (NCBI) non-redundant database, UniProt, TIGRFam, Pfam, PRIAM, KEGG, COG, and InterPro databases. Additional gene prediction analysis and functional annotation was performed within the Integrated Microbial Genomes - Expert Review (IMG-ER) platform . The genome consists of a 1,843,267 bp long chromosome with a 54.9% G+C content (Table 3 and Figure 3). Of the 2,038 genes predicted, 1,986 were protein-coding genes, and 52 RNAs; 19 pseudogenes were also identified. The majority of the protein-coding genes (54.9%) were assigned a putative function while the remaining ones were annotated as hypothetical proteins. The distribution of genes into COGs functional categories is presented in Table 4. Table 5 shows the whole-genome distances between P. fumarii and the other type strains within the order Desulfurococcales [15–21] as calculated using the genome-to-genome distance calculator [52–54]. As expected, the distances to the only other member of the family Pyrodictiaceae, H. butylicus, are lower than those to the members of the Desulfurococcaceae. This does not hold for formula 2, which is affected by saturation: if only HSPs of more strongly conserved genes are obtained, these contain, on average, a higher proportion of identical base pairs . Genome-to-genome distances between P. fumarii and the genomes of other type strains within the order. The formulas are: 1 - HSP length/total length; 2 - identities/HSP length; 3 - identities/total length [52,53]. Figure 4 shows a neighbor-joining tree inferred with PAUP*  from the logarithmized version of distance 3. 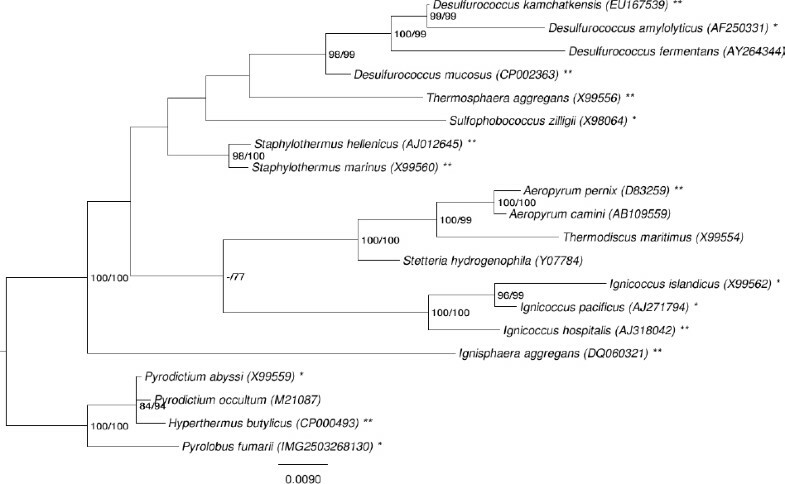 The tree differs from the 16S rRNA-based tree (Figure 1) regarding the position of Ignisphaera aggregans, which is placed as sister group of all other Desulfurococcaceae by the 16S rRNA, but of Staphylothermus in the whole-genome tree. GGDC NJ tree inferred from the type strain genomes within the order Desulfurococcales. The fraction of shared genes in the genomes of P. fumarii, its closest neighbor H. butylicus, and as an outgroup I. aggregans (see Figure 1) is shown in a Venn diagram (Figure 5). The numbers of pairwise shared genes were calculated with the phylogenetic profiler function of the IMG-ER platform . The homologous genes within the genomes were detected with a maximum E-value of 10-5 and a minimum identity of 30%. 719 genes (39%) are shared by P. fumarii, I. aggregans and H. butylicus. P. fumarii and H. butylicus share 410 genes, whereas I. aggregans shares only 89 and 177 with H. butylicus and P. fumarii, respectively, corroborating with the larger phylogenetic distance. With only 398 genes (25%) H. butylicus contains the smallest fraction of unique genes (and the smallest genome, 1,616 genes), while I. aggregans has not only the largest genome (1,992 genes), but also the highest fraction of unique genes (51%) in this set of organisms. 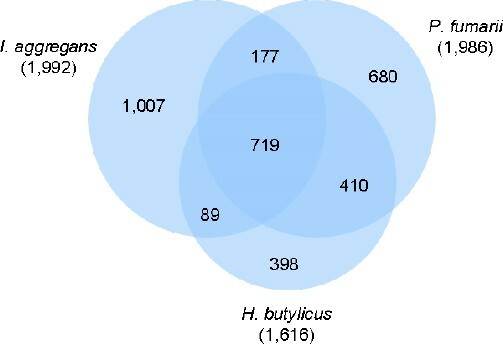 Venn diagram depicting the intersections of protein sets (total numbers in parentheses) of P. fumarii, I. aggregans and H. butylicus. This work was performed under the auspices of the US Department of Energy Office of Science, Biological and Environmental Research Program, and by the University of California, Lawrence Berkeley National Laboratory under contract No. DE-AC02-05CH11231, Lawrence Livermore National Laboratory under Contract No. DE-AC52-07NA27344, and Los Alamos National Laboratory under contract No. DE-AC02-06NA25396, UT-Battelle, and Oak Ridge National Laboratory under contract DE-AC05-00OR22725, as well as German Research Foundation (DFG) INST 599/1-1 and SI 1352/1-2 and Thailand Research Fund Royal Golden Jubilee Ph.D. Program No. PHD/0019/2548’ for MY. BauA 2005. Classification of bacteria and archaea in risk groups. http://www.baua.de TRBA 466 p. 286. The DOE Joint Genome Institute. http://www.jgi.doe.gov. Phrap and Phred for Windows. MacOS, Linux, and Unix. http://www.phrap.com.